Are you excited about Halloween yet? My son has been asking me everyday how much longer he has to wait! 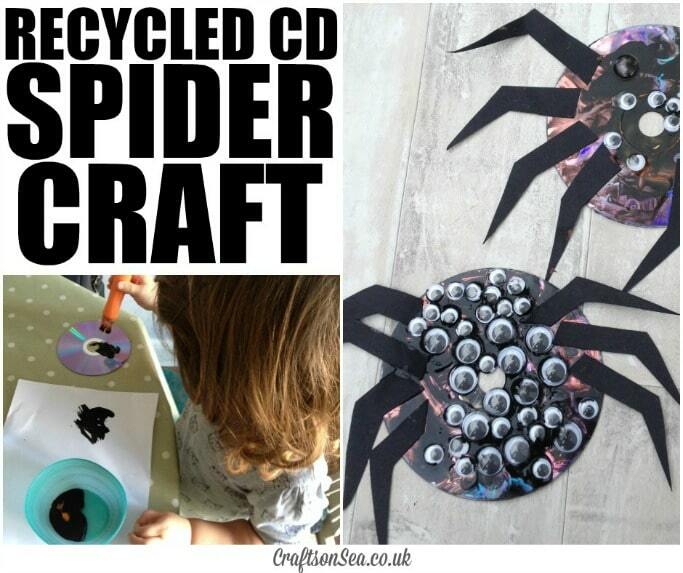 As I can’t move the big day forward at all I thought we’d try out this recycled CD spider craft. As we love sharing crafts for toddlers these were made by my two year old as well as my four year old, I think they’re a pretty cute halloween craft for kids but my son informs me they’re super spooky! 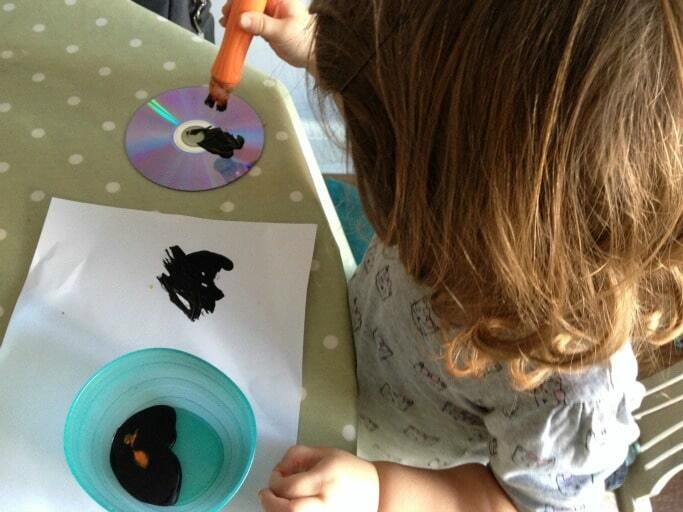 Turn your CD onto the plain side and start painting. As an aside, the exact moment my kids started spashing the black paint around was the same moment I remembered I’d just had all the lovely new clean white grouting done next to the sink in the bathroom. Fun times! For this reason I always recommend keeping a packet of baby wipes next to you when you are painting so you can get rid of most of the mess before your kids leave the table. Painting onto CDs makes a nice change from paper and you can lookat how the light is still ableto reflect through in some places. Once your kids are sufficiantly happy with their painting it’s time to add the legs and the googley eyes! While my daughter really enjoyed the painting she only stuck one eye on herselfso my son helped her finish her spider. 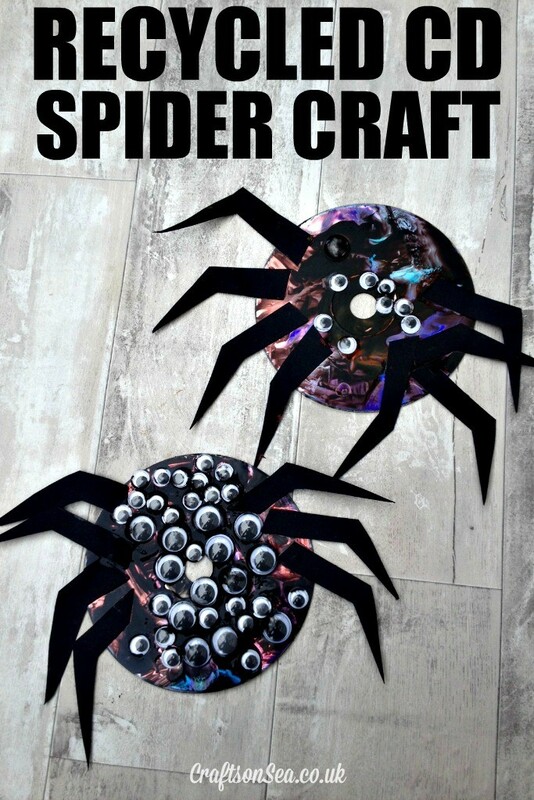 I cut the legs out of some black cardstock and these were stuck on along with eyes while we chatted about how many legs and eyes spiders have. Did you know most spiders have eight or twelve eyes? Of course we originally aimed for twelve eyes on my son’s spider but we do rather like googley eyes round here so might have gone a bit overboard?!? It’s a great opportunity to practice some counting too, although I must admit that when I went to photograph these the next day I suddenly realised one of the spider legs was missing – oops! Once your spiders are dry they are ready to hang up for Halloween!